Meet Scott M. Staffel, D.D.S. Dr. Scott M. Staffel is a General Dentist and Owner of Staffel Dental, a comprehensive and preventative dental practice with an emphasis on Health, Restorative treatment, Cosmetics and Quality dental treatment in Bedford, TX. Dr. Staffel exudes a very positive chair side manner, and makes sure each patient is at ease from their very first meeting. This has earned him a reputation as one of the best dentists in Bedford, and many individuals and families in the Bedford Community trust him with their brilliant smiles. Dr. Staffel performs preventative, restorative, and cosmetic dental treatments and procedures for children and adults. 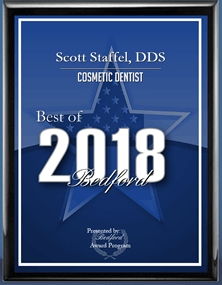 With a lifetime of dental experiences, Dr. Staffel is an award-winning dentist, and has been chosen by the community as "Top Rated Dentist" in Bedford, TX for 2017 and 2018. Dr. Staffel is certified for laser dentistry, sedation dentistry, Invisalign® Orthodontics, CEREC® CAD/CAM same-day crowns, and Level II sedation with advanced cardiac life support. He is an exceptionally well-trained family dentist, who makes creating smiles look easy, dreams come true and beautiful healthy smiles a reality. Dr. Staffel received his Doctorate of Dental Surgery from Texas A&M University Baylor College of Dentistry in Dallas, TX, and he has been brightening smiles ever since. In addition to his advanced degree, Dr. Staffel has extensive hours of continuing education, and has studied under many of the foremost leaders in the field, including his own father, Dr. Edward Staffel, D.D.S. Dr. Staffel is a Texas native, who was born and raised in San Antonio, TX. He loves raising his family in this region of his home state. Dr. Staffel has 3 children, Mixson, Sarah, and Ben. Scott M. Staffel, D.D.S. is a compassionate General Dentist helping many patients achieve their dental health goals and build smiles that will last.